Need a Crystal Ball on Polaris Industries? Try This. In this series, I examine inventory using a simple rule of thumb: Inventory increases ought to roughly parallel revenue increases. If inventory bloats more quickly than sales grow, this might be a sign that expected sales haven't materialized. Is the current inventory situation at Polaris Industries (NYS: PII) out of line? To figure that out, start by comparing the company's inventory growth to sales growth. 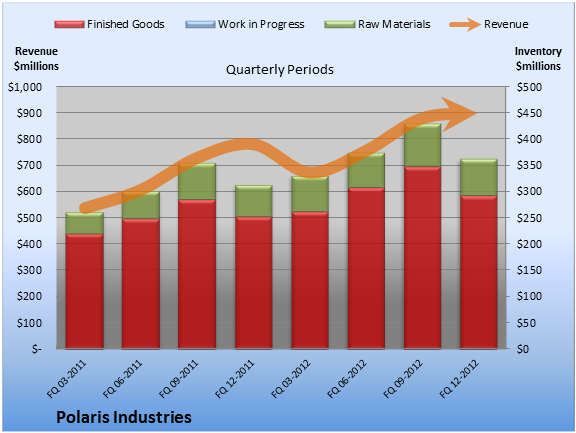 How is Polaris Industries doing by this quick checkup? At first glance, OK, it seems. Trailing-12-month revenue increased 21.0%, and inventory increased 15.8%. Comparing the latest quarter to the prior-year quarter, the story looks decent. Revenue expanded 15.2%, and inventory expanded 15.8%. Over the sequential quarterly period, the trend looks healthy. Revenue grew 2.4%, and inventory dropped 15.9%. Let's dig into the inventory specifics. On a trailing-12-month basis, finished goods inventory was the fastest-growing segment, up 15.5%. On a sequential-quarter basis, each segment of inventory decreased. 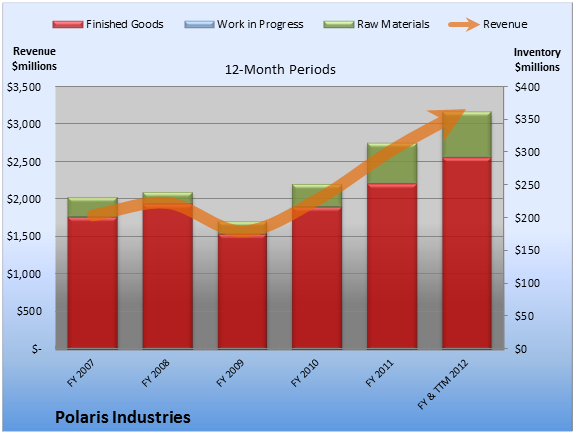 Polaris Industries seems to be handling inventory well enough, but the individual segments don't provide a clear signal. Looking for alternatives to Polaris Industries? It takes more than great companies to build a fortune for the future. Learn the basic financial habits of millionaires next door and get focused stock ideas in our free report, "3 Stocks That Will Help You Retire Rich." Click here for instant access to this free report. Add Polaris Industries to My Watchlist. The article Need a Crystal Ball on Polaris Industries? Try This. originally appeared on Fool.com. Seth Jayson had no position in any company mentioned here at the time of publication. You can view his stock holdings here. He is co-advisor ofMotley Fool Hidden Gems, which provides new small-cap ideas every month, backed by a real-money portfolio. The Motley Fool recommends Polaris Industries. Try any of our Foolish newsletter services free for 30 days. We Fools may not all hold the same opinions, but we all believe that considering a diverse range of insights makes us better investors. The Motley Fool has a disclosure policy.